I often watch video recipes on my smartphone while cooking. I always wash my hands before I start cooking, but it’s never occurred to me to wash them again each time I touch my phone. Can that make me sick? 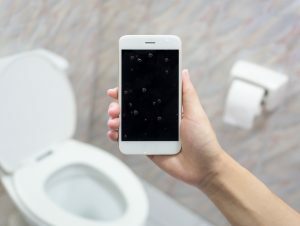 The average smartphone is 10 times dirtier than a toilet seat. I don’t want to totally gross you out, but the average smartphone is 10 times dirtier than a toilet seat. In fact, the average person touches their smartphone 2,617 times a day, according to a study by dscout, a Chicago-based research firm. Because people often take their phones with them everywhere, including into the potty, various microbes are transferred when the phones are touched. Some of those microbes can survive for up to 16 months, according to research published in 2006 in BMC Infectious Diseases. Research has also shown that smartphones and tablets can harbor bacteria such as Streptococcus, Staphylococcus aureus, and even Escherichia coli or E. coli. Staphylococcus aureus is particularly harmful considering it is a bacterium that is growing increasingly impervious to antibiotics and has emerged as a top killer of hospitalized patients, according to researchers at Harvard Medical School. So, if you are using your phone or tablet to watch cooking demonstrations or look up recipes while cooking, you really should wash your hands each time you touch your device. “Consumers play an important role in the safety of the food they eat and are the last line of defense for preventing foodborne disease, because safe, in-home preparation and consumption practices can reduce the risk of illness,” according to a food safety study in the Journal of Food Protection. However, the study found that 40 percent of people say they don’t wash their hands after using a device, like a smartphone or tablet, while cooking. Another study, co-authored by Sanja Ilic, food safety specialist for Ohio State University Extension in The Ohio State University College of Food, Agricultural, and Environmental Sciences (CFAES), found that most consumers don’t pay much attention to clean hands between handling exposed foods and touching unsanitary electronic devices, body parts or hair, and surfaces. That can lead to foodborne illnesses, including norovirus, which causes vomiting and diarrhea, and is the leading cause of foodborne illness outbreaks. It’s estimated that the average person will get norovirus five times during his or her lifetime, according to a report in Food Safety News. And remember to wash your hands each time you touch your smartphone or tablet while cooking!